I can understand someone getting a little bewildered about our relationship with Srila Prabhupada’s godbrothers before his letters and conversations were published, but what excuse does anyone have now? Any of Srila Prabhupada’s so-called disciples who still insist on associating with Srila Prabhupada’s godbrothers or godnephews after reading the quotes below are obviously not very sincere or very serious about following Srila Prabhupada’s instructions. Please keep in mind, while reading the quotes below, that Srila Prabhupada has never retracted any of them. Some extremely self motivated people might say that he apologized to his godbrothers on his death bed, but how can this be considered any more than just polite talk, or setting an example for his disciples of how to try and make amends before leaving this material realm? Also, I have never heard of any tape recording which documents this supposed apology, and it’s not in the VedaBase. Where is the proof? Even if Srila Prabhupada did apologize to some of his godbrothers, how could this be considered a retraction, especially for the April, 1974 letter to Rupanuga, which is a signed document, and which contains the instruction to all of his disciples, “This is my instruction to you all.” No contradictory instruction that even comes close to this direct, authoritative, signed document has ever been produced. I can understand someone getting a little bewildered about our relationship with Srila Prabhupada’s godbrothers before his letters and conversations were published, but what excuse does anyone have now? Any of Srila Prabhupada’s so-called disciples who still insist on associating with Srila Prabhupada’s godbrothers or godnephews after reading the quotes below is obviously not very sincere or very serious about following Srila Prabhupada’s instructions. “Our big, big godbrothers in India, they could not preach Lord Gauranga’s name all over India. 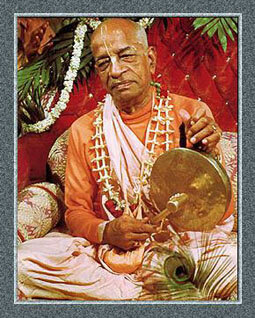 They are simply inclined to criticize me, that my students call me Prabhupada. They could not do anything practical and tangible. They are satisfied with a temple and a few disciples begging alms for the maintenance of the temple. The “simple” disciple of Srila Prabhupada will simply follow his or her spiritual master’s instructions, and refuse to associate with any of Srila Prabhupada’s godbrothers or godnephews. The “crooked” disciple, on the other hand, finds so many excuses to try and rationalize such forbidden association.